The C.C. is a large, semi-acoustic guitar that has, on the one hand, strong character and unique style, while, on the other hand, it is capable of mastering nearly any genre. 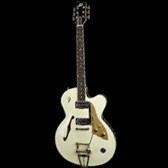 This is due in part to the special Duesenberg pickup assembly that includes a Domino P90 and a grand Vintage humbucker. It also owes quite a bit to the tricked-out details at the heart of its design. A full and rich sound spectrum extends in all directions from clean and crisp to crunchy and distorted – while a certain characteristic twang always shines through with transparency and brilliance. 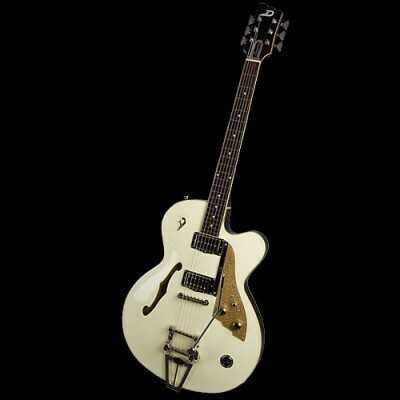 And while we are on the subject of shining: the extreme musical functionality of the Deluxe Tremola, equipped here with a longer bar, makes playing this guitar a real pleasure! Size:	51,5 x 41 x 6,8 cm / 20.27" x 16" x 2.75"